Covering around 114,000 acres (46,000 hectares) of central Australia, Finke Gorge National Park is one of the Red Centre’s most startling wilderness areas. The Finke River formed around 300 million years ago, and some sights, such as Palm Valley with its rare red cabbage palms, seem to re-create the landscapes of that lost world. Finke Gorge National Park is usually visited from Alice Springs, the Red Centre’s largest town and exploration hub, although there is camping in the Aboriginal settlement of Hermannsburg nearby. To enter the park, a 4WD with high clearance and the skills to drive it are essential, and even then it’s safest to travel in convoy. Given the challenges of driving, most travelers choose to visit on an organized 4WD tour from Alice Springs with a professional driver/guide. Finke Gorge National Park day tours generally center on the Palm Valley oasis but will often include views from the Kalarranga Lookout and a stop in Hermannsburg, once home to Aboriginal watercolorist Albert Namatjira. Remote and rarely visited, Finke Gorge National Park is a must for adventurers, nature lovers, and geology fans. There is a basic campground in the park. Bring all required supplies, including food and water. As with other Red Centre natural attractions, beware the fierce summer sun. Carry plenty of water and wear a hat and sunscreen. Don’t stray from the tracks in Palm Valley—you can crush emerging palms. Rugged terrain means Finke Gorge National Park is not generally wheelchair-accessible. Finke Gorge National Park is located about 86 miles (138 kilometers) west of Alice Springs in central Australia. If driving a high-clearance 4WD, head south just after Hermannsburg. Public transport is not an option out here, so travelers who are not experienced 4WD drivers generally join an organized tour, typically with door-to-door round-trip transfers. 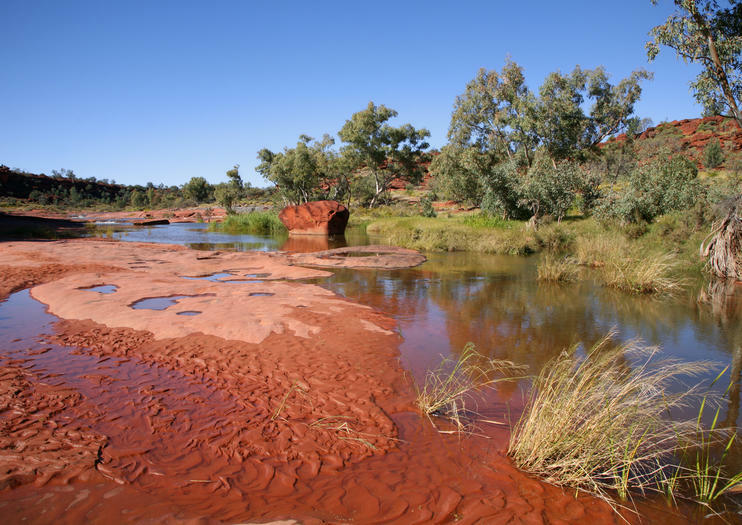 The riverbed is the main track in Finke Gorge National Park, and the park becomes impassable after heavy rain or when the Finke River is in flood. Outside those occasions, it is open 24 hours a day, seven days a week. Aim to visit during the cooler months of the year, roughly April through September. If traveling during hotter months, hike early in the morning or late in the afternoon to beat the heat. The star attraction of Finke Gorge National Park is Palm Valley, where red rock walls merge with thousands of red cabbage palms, cycads, and slender red gums to create a distinctly prehistoric impression. A couple of clearly signposted walks explore Palm Valley: the 1-hour Arankaia Walk and the 2-hour Mpulungkinya Walk. Zip along sandy tracks, rugged cliffs and sandstone hills on a thrilling 4WD tour of the Finke Gorge National Park from Alice Springs. Keep your camera close to hand as you pass the dramatic landscapes of Palm Valley and the Finke River; take in the views from the Kalarranga Lookout; and learn about the Western Arrernte Aboriginal people in the Hermannsburg Historic Precinct. This full-day tour includes lunch and hotel pick-up. Travel the Oldest River in the World which still runs it's original course.A truly unique way to experience the rugged beauty of Central Australia. Finke River Adventures use ATV vehicles and work with local Aboriginal guides (when available) to travel through the Finke Gorge National Park with tours to Palm Valley and beyond.Travelling along our own tracks where few others have ever been, we are uniquely licensed to show you places of extraordinary beauty and cultural importance.